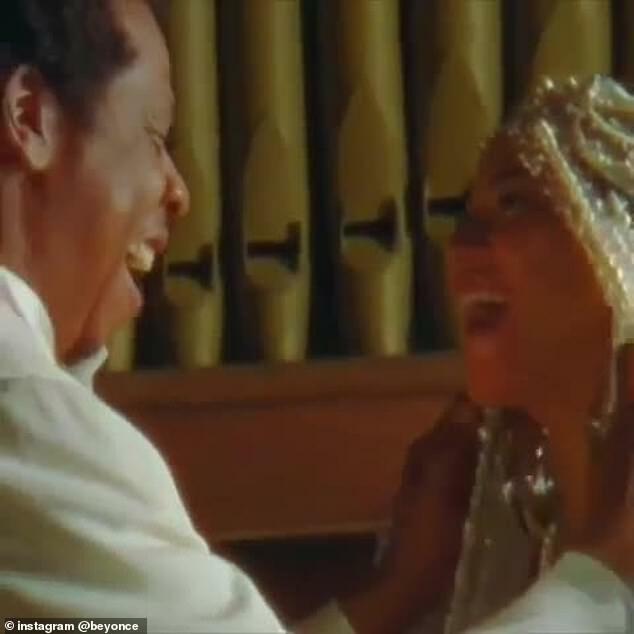 Beyoncé gave the Bey Hive a thrill when she let fans get a glimpse at the white wedding gown she wore for her vow renewal ceremony with Jay Z in a new Instagram post. 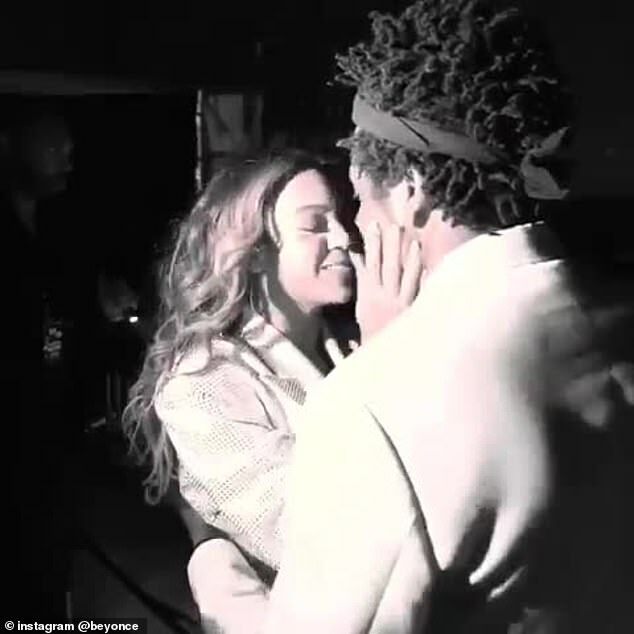 Queen Bey shared the image as part of a video montage looking back on 2018 on social media Wednesday. The video flashed images so quickly that it took days to spot the stunning shot from the couple’s recent vow renewal. 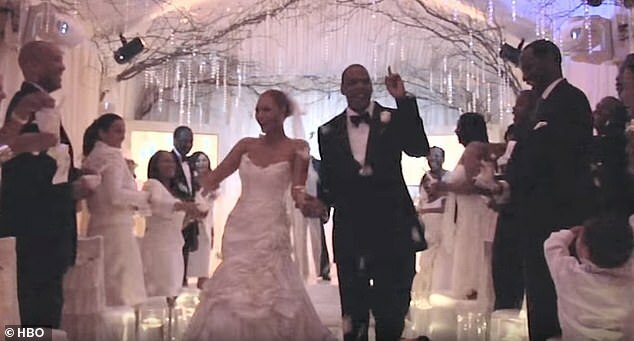 Over the summer, the power couple hinted that they renewed their vows in a similar montage-style video during a concert on the On The Run II tour that included a close up shot of what appeared to the ceremony. ‘Wishing you a beautiful 2019,’ the 37-year-old captioned her recent video. The short montage featured a massive collection of rapid fire images and video clips from the last 12 months. There were concert shots, home movies and a endless stream of amazing ensembles. Some of the moments, like shots of her daughter Blue, were slowed down a bit for effect. 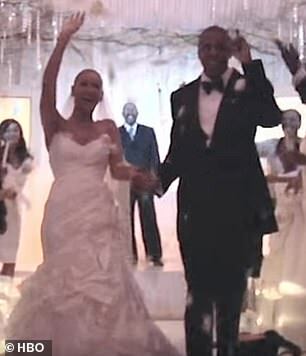 It was impossible to catch it all in one watch but one brief moment stood out among the pack and it was Bey in a wedding gown. The shot showed the couple posing together outdoors. Jay looked handsome in a white tuxedo and a pair of sunglasses as he stood embracing his wife. While Bey was a vision of perfection in a form fitting long sleeve white off-the-shoulder gown with an enormous sheer veil. The beauty’s hair was slicked back in a similar style to the way she wore it in her first wedding and she donned a pair of small white retro looking sunglasses. The Galia Lahav gown reportedly cost the Grammy winner $10,300, according to TMZ. 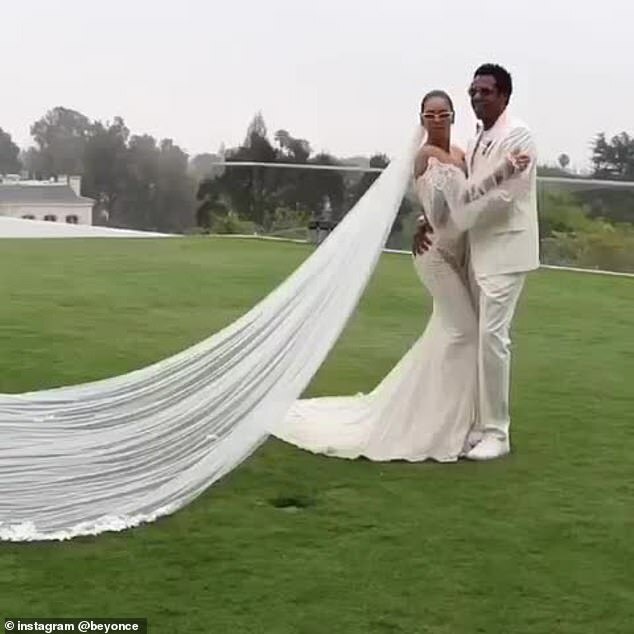 In June, the designer confirmed that Beyoncé wore the label’s Thelma wedding gown for a ‘vow renewal,’ reported People. 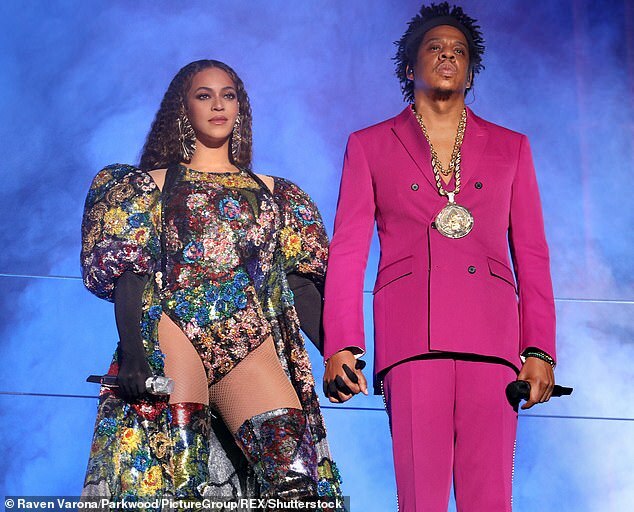 ‘Galia Lahav announced that Beyonce wore a gown from the Victorian Affinity collection, which paid homage to Queen Victoria’s wedding dress through the corseted bodice, Chantilly lace and the Victorian bustle train details on the gown,’ the outlet reported. 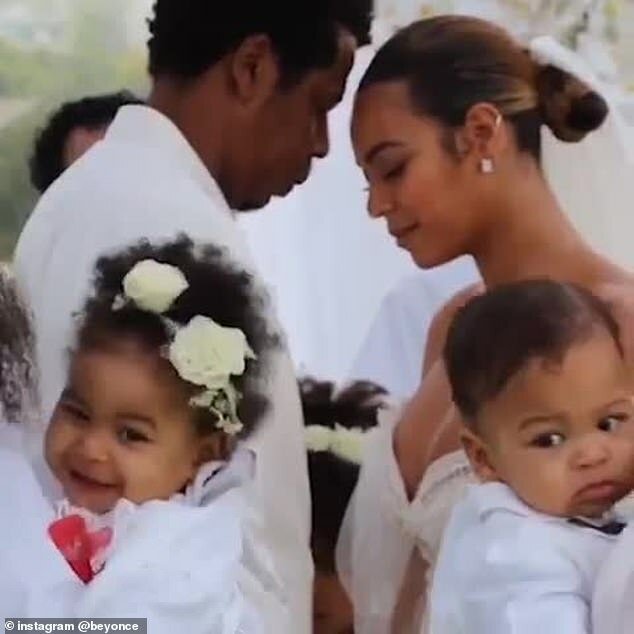 During a stop on Jay and Bey’s recent tour over the summer, the pair shared a similar video that gave fans a glimpse at their new twins Sir and Rumi as well as a close up shot of their vow renewal ceremony. The couple celebrated their 10 year wedding anniversary in April of 2018. At their wedding in 2008, which was shockingly kept under wraps from the press, Bey wore a designer close to her heart but ultimately didn’t love the dress. Her tiered strapless ballgown was designed by mom Tina Lawson who used to create the costumes for Destiny’s Child. 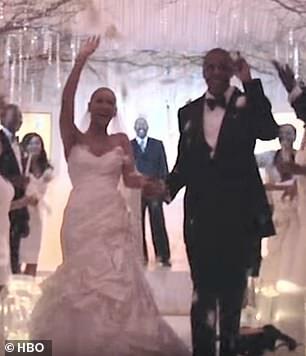 As is par for the course for the couple, Bey and Jay shared shots of their first wedding in the 2011 music video for I Am Here and again in a montage the Young Forever/Halo video.